Riffing on the iconic Silver Age back-turned-and-suit-in-the-garbage-can cover by John Romita, this week’s final-for-now issue of Amazing sees Spider-Man’s current tableau in similar ruins. As the third part of “The Graveyard Shift” storyline, there’s a good amount of conclusion but very little that truly satisfies. The cover’s “steaming heap” is too obvious a dig but pulling the positives from this wreckage may take an actual professional trained in using the “Jaws of Life”. What’s most boggling is that it’s the regular team: Dan Slott with oft-time writing co-conspirator, Christos Gage; Penciler Humberto Ramos with Victor Olazaba on inks and colorist Edgar Delgado- a fairly road-tested Spider-gathering assembled for a fairly auspicious occasion of some profile. It sounds like it should yield something memorably provocative if not fun. However, what transpires not only feels rushed and uneven, it also feels lackluster and never really catches spark (despite various explosions and fires). It also executes in a manner that isn’t easy on the “casual” reader. Newer characters like Clayton Cole and Regina Venderkamp are underexplained at best, the latter entirely unnamed in the current installment yet apparently a key player in the ongoing subplot/ backing feature (thank you, Google). 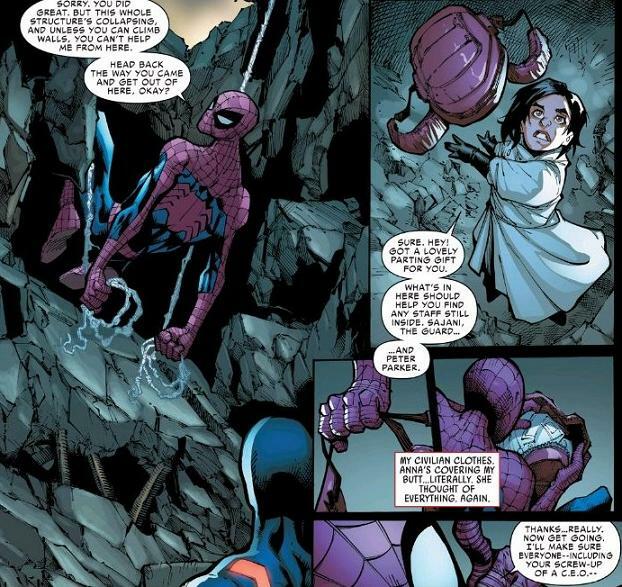 There’s also the thinly-veiled and winkingly goofy perpetuation of Peter’s secret identity. It’s hard to differentiate which characters may be in on it from those just scripted to make pointed assessments. Let’s not forget that Spidey’s entire backing cast consists of a bunch of super-geniuses and his closest friends and family. To which, the delivery is at times facepalm-inducing. Like Scooby Doo thin, the veil (zoinks!). Thankfully, there’s a creative hiatus coming up on this particular track. Really, Ghost? You wanna play “What If?” with Parker?! Pick a battle you can win, man! The villainous means by which the current status quo winds down also deems some mentioning. 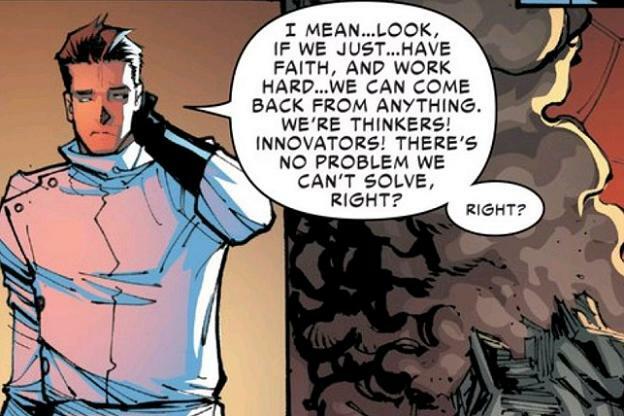 Generically reverting to “corporate saboteur” two-dimensionalities, Slott and Gage undo a lot of the creepy character nuances that Jeff Parker and others instilled in Ghost throughout Thunderbolts and Dark Avengers. 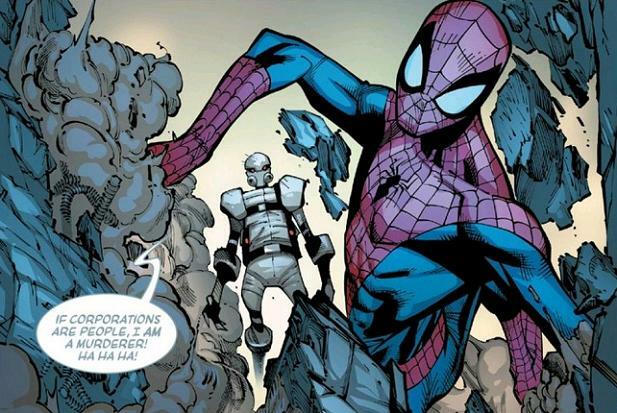 Pitting the ethically-motivated techno gadfly as an opponent during Otto’s Superior Spider-Man phase would have been a better showcase, displaying better juxtaposition between a villain playing the straight and narrow and a self-righteous mercenary trading on dubious moral high ground. Don’t let the caption distract you from noting the subtle capture of motion…. Sorry, none of that here. Instead, Parker Industries just comes down. Why? Because. But really, who didn’t see this coming? The second Peter’s back in the driver’s seat of his body and inherits the agency Otto established in his stead, there’s an absolute timer counting down. After all, “Parker Luck”, not dark matter, is the absolute underlying force of the universe. In an issue with a lot of dip, the one bright spot of consistency is color artist Edgar Delgado. Not pulling off anything overtly “flashy”, Delgado still infuses a good amount of “pop” into the all-nocturnal proceedings. There’s one distinct sepia Black Cat/Spidey flashback panel as well as very subtle spectrum shifts to indicate motion and refraction in both Ghost’s gauntlet as well as the Living Brain’s robotic faceplates. Think of it like The Phantom Menace– the story’s not much but some of the shots bear discussion. For a title once long-considered Marvel’s flagship, the (temporary) last regular issue of Amazing Spider-Man is, sadly, nothing much to write home about. There’s some short-term payout but any additional eyeballs brought in for a glimmer of pre-Secret Wars sneak-peeks will go wanting. However slapdash the culmination, things are now wide open for the Spider-camp and this is good. Tomorrow looks like it can take care of itself. The immediate? Not so much. For a title once long-considered Marvel’s flagship, the (temporary) last regular issue of Amazing Spider-Man is, sadly, nothing much to write home about.